Hot on the heels of Huawei's announcement of the Ascend Mate7 at IFA 2014, it's the perfect time to take the company's new high roller for a spin. 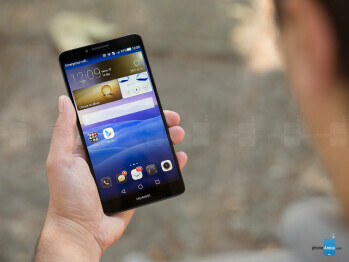 There's much about the latest Huawei flagship that sets it apart from the crowd – it's got a very large, 6-inch screen, a metal body, a speedy new processor, and an industry-leading fingerprint sensor implementation. If that wasn't enough, the company has also endowed the Mate7 with a 13-megapixel rear camera and a massive, 4100 mAh battery, all fitted within a slender, 7.9 mm profile. Is the Ascend Mate7 as good as its specs suggest, and can it compare with what the competition has to offer? Let's find out! The Mate7 covers all bases: slim profile, premium materials used with the body, and sturdy overall construction. Based on looks alone, the Huawei Ascend Mate7 is an easy sell. The device's rectangular form with rounded corners isn't anything new or different by any means, but it has to be said that its metal back is very attractive and fairly neat. So what about ergonomics? Obviously, this is a pretty large device by most standards, though there are a few things to keep in mind. 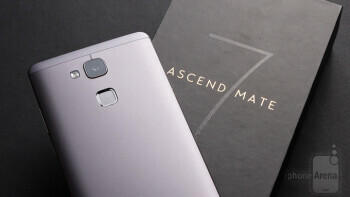 First and foremost, thanks to its extremely thin bezels, the Ascend Mate7 is among the most compact 6-inchers on the planet, measuring “just” 6.18 x 3.19 x 0.31 inches (157 x 81 x 7.9 mm), and it's actually not much larger than the 5.7-inch Samsung Galaxy Note 4, and almost on par with the new 5.5-inch Apple iPhone 6 Plus. However, don't misunderstand this to mean that you can comfortably operate this phablet with one hand – you're still better off with two – but any savings in dimensions when talking such large devices are definitely welcome. Looking at the rear of the Mate7, it's where you'll find the touch fingerprint sensor, with its large square opening and chrome edge, but more on that later. Immediately above it sits the camera and the LED flash, while a small grill opening for the loudspeaker can be found on the bottom left. While still on the topic, we definitely like the ever so slightly rounded backplate, as it tapers off at the sides, providing a comfortable grip. Turning the Mate7 sideways, we've got both the power button and volume rocker comfortably placed on the right, within a thumb's distance. The two are made out of metal and provide great tactile feedback and travel time. Pretty darn good, this one. But not perfect. As touched on already, the Ascend Mate7 has a pretty massive, 6-inch display. The IPS LCD panel has a pixel resolution of 1080 x 1920, good for 367 pixels per inch. Obviously, this isn't a record-setting pixel density, but the image is still very crisp. The maximum brightness the screen on the Mate7 can achieve peaks at a little over 480 nits, which is good, and in our experience provided a very adequate viewing experience outdoors. The screen also has a good color temperature of 7111 K (6500K being the reference value), meaning that it's only slightly colder-looking than it should. As for the color accuracy of the display, Huawei has done a very good job – the average RGBCMY color error (Delta E) is 2.89 – and hues on the whole trail their target values fairly closely, with the exception of magenta. As for the rest, we're generally looking at small deviations that either push a color's specific intensity over or under the ideal saturation threshold. Lastly, gamma, at 2.25, is excellent. The EMUI is anything but dull. But if you don't like it, there are ton of theme options built-in. Huawei's latest 3.0 update to its Android 4.4.2 KitKat-based EMUI skin sure is a looker. Perhaps the first thing you're bound to notice is that the company has already made the transition to the new Android L software navigation buttons – a triangle for back, a circle for home, and a square for multitasking. EMUI is also somewhat similar when looking at the settings menu, which is airy, and uncluttered. Highlights of the software include a theme manager with a wealth of available choices, along with a very detailed and functional power saving tool that will break down power usage based on hardware and software, track apps that are acting up and drawing too much power (and offer to close them), and also even report back the amount of drawn power per entry down to the mAh level. And if you somehow run out of juice, the Mate7 will offer its Ultra power saving mode, which turns the device into a feature phone (calls and texts) with a black-and-white UI. There's also a dedicated one-handed mode, accessible through the quick settings in the notification bar. We wish Huawei spent more time on this one, however – the UI's size under the special mode does not change and, instead, only the software navigation keys are pushed to either the left or right, and some elements, like the dialer keypad, are also moved to your preferred side. The most standout feature of the Mate7 is obviously the fingerprint scanner on its back. Without a doubt, this is the best solution currently on the market, overshadowing even the Touch ID sensor on the iPhone 5s (and soon, the new iPhones). Like Apple's solution, we're looking at touch-type identification, but here we're talking about even lower response times, and great accuracy. What makes the scanner even better is the fact that you don't need to first wake up the device – it'll work even from a locked state. If that wasn't enough, the sensor will also register your print even if your finger is a bit wet, though it obviously won't work if you just washed your hands; and you can also use it to fingerprint lock certain apps and private content. Last, but not least, the sensor's placement at the back, just under the camera, is well-thought out, as it's where your index finger naturally looks for support. 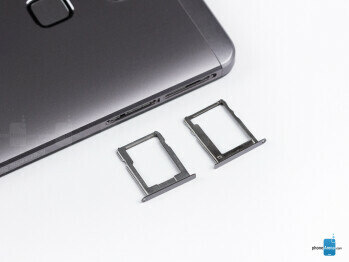 Tactile feedback is also excellent, as the square cut-out is recessed into the body of the Mate7, making it easy to locate even early on, when you're still learning to work with it. 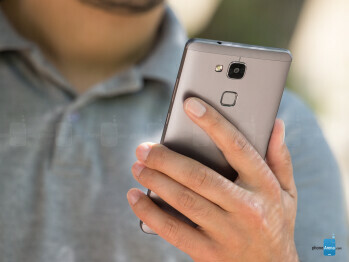 The one thing we wish Huawei would improve in the future concerns failed readings – the Mate7 vibrates whenever those occur, but instead of going for a second try automatically, it forces you to remove your finger and go for another try. Huawei's processors never looked quite so formidable! One of the big surprises with the Mate7 is Huawei's home-grown HiSilicon Kirin 925 system-on-chip. This is an octa-core processor with two clusters of four cores – one with efficient, 1.3GHz Cortex-A7 cores, and another, with powerful, 1.8GHz Cortex-A15 ones. The SoC works in an ARM big.LITTLE configuration, meaning that trivial tasks are taken care of by the power-efficient cluster of Cortex-A7 cores, without powering on the rest. If maximum performance is needed, however, all eight CPUs can be powered on simultaneously. On the graphics side of things, we're looking at a quad-core Mali-T628 GPU, clocked at 600MHz. As for memory, there are two options available – the one we've got at hand, with 16GB of built-in storage and 2GB of RAM, and another, with 32GB and 3GB, respectively. Both models support storage expansion through microSD. The above configuration, according to both synthetic benchmarks and our own real-world tests, delivers top-notch performance, and can easily compete with the likes of Qualcomm's Snapdragon 801. That's darn impressive, considering Huawei's fairly unimpressive track record with custom silicon. FDD LTE support for 9 bands! 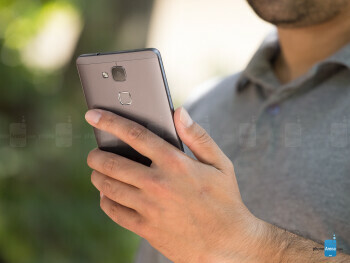 The Ascend Mate7 is quite the connected device, boasting support for Cat 6 LTE (up to 300Mbps) on FDD bands 1, 2, 3, 4, 5, 7, 8, 20, and 25 (that's a lot), along with Bluetooth 4.0, NFC, USB 2.0, A-GPS, and Wi-Fi 802.11 a/b/g/n. As for web browsing, Huawei has equipped the Mate7 with its own browser, which is actually a pretty decent performer, and a looker, too. It has extras like full-screen mode and incognito tabs, and load times are better-than-average. Not bad by any means, but leaves something to be desired. 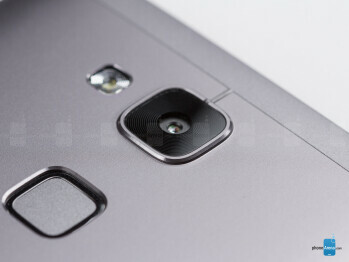 On board at the Ascend Mate 7's rear is a resident 13-megapixel, 1/3.06'' Sony IMX214 sensor, with f/2.0, 28mm wide-angle lens. Huawei has gone for a very minimalistic approach with the camera UI, which, by the way, looks a lot alike to what you get with an iPhone on iOS 7. Brushing past this tidbit, we're loving the ergonomics and looks of the spaced-out UI, but we do miss the option to manually set variables, such as ISO, white balance, and the like. Nevertheless, the software is not without its goodies, and has support for HDR photos, panoramas, beauty shots, and even “Best photo”, which works by shooting a number of snaps in a quick succession, and then, with varying success, picks the best shot. There's also a special, “Ultra snapshot” feature, which is not obvious at first, but it basically allows you to double tap the volume down key while the phone is locked, and take a snap real fast. Huawei says 1.2 seconds on average, but in our experience it's even faster. That said, this is still a spur-of-the-moment type feature, as the camera has too little time to focus, so shots are not perfect by any means. Moving onto quality of snaps, we've gotta say that, on the whole, we're looking at a capable shooter. On the plus side, stills can be properly exposed and realistic in terms of color reproduction. Unfortunately, we can't say that the results were always predictable – for example, outdoor snaps are sometimes underexposed and are visibly cold (bluish). Interestingly enough, when shooting indoors, the situation is reversed – snaps are warmer, and that skews color reproduction slightly. As for stills taken in darkness, we're happy to see that colors remain vibrant (if slightly overstated) even when the LED flash goes off. Sadly, the power of the flash leaves something to be desired, and objects towards the sides of photos tend to not get sufficiently illuminated. Turning the Mate7 around, we're faced with a 5-megapixel selfie snapper, good for 1080p video capture for the occasional video chat. The unit delivers very agreeable results, and is on par with other heavyweights, like the One M8, but trails the amazing 8-megapixel shooter at the front of the Huawei Ascend P7. Whilst on the topic of the Ascend P7, it's worth pointing out that the Mate7 too can do selfie panoramas, but the maximum resolution of about 2.5 megapixels is a bit underwhelming. As a camcorder, the Mate7 is alright, but we've definitely seen better at the flagship level. Perhaps the biggest irk is exposure – while it is continuously adjusted during recording, clips are consistently underexposed. So, in addition to making scenes look darker than in reality (it was a sunny day outside! ), this also serves to obscure finer details. On the plus side, clips are fluid, and the frame rate does not drop even in darkness. As for extra shooting modes, there are unfortunately very few of those. With the exception of 1080p capture at 30 frames per second (FPS), and 720p HDR video, the Mate7 fails to match what the competition offers, like 4K UHD video, extra-fluid 1080p clips at 60 FPS, and even slow-moes. Thankfully, Huawei hasn't dropped the ball here, so expect quality 1080p playback of clips with various encodings, including MKV, DivX, Xvid, and H264. In terms of audio reproduction, you won't find the Mate7's rear-placed speaker lacking in loudness, but we can't say clarity is excellent. Unfortunately, the placement of said speaker is problematic, and laying the device top down means muffled sound. As for the software, we're looking at a skinned, but stock Android video player, though the company has made some changes with the music one. For one, it is much fancier than the stock music player, and the visuals are quite attractive. But when it comes to functionality, the Mate7 doesn't really bring much to the table, with, perhaps, the exception of lyrics support. Unfortunately, we can't say that the Mate7 is Huawei's finest in terms of call quality. The microphone had a better showing, and the other side heard us loudly and clearly for the most part. However, the earpiece is a tad too impotent in the volume department, and voice quality is only average, with voices sounding a bit digitized, even if tonal information is still there. 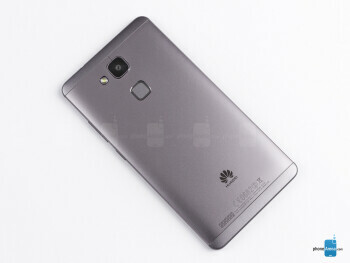 Huawei has endowed the Ascend Mate7 with an enormous, 4100 mAh cell. As can be expected, that's more than plenty enough to get you through at least two days, and even over that, so long as you're conservative with your usage. The above is corroborated by the results from our battery life test, on which the Ascend Mate7 clocked 9 hours and 3 minutes. That's a significant premium over rival phablets, like the LG G3 (6h 14m) and the Samsung Galaxy Note 3 (6h 8m). In fact, when looking at devices with a 1080 x 1920 resolution screens, Huawei's Mate7 is the current king of the hill. In fact, looking at the full picture, it's hard to pinpoint any one segment in which the Mate7 under-delivered on its high-end promise. That doesn't mean it's perfect – the camera could use some work, and the UI has some kinks to straighten out. But in every other way, this is a great pick, especially if you're looking for a phablet. So how much is Huawei expecting for you to part with, and when and where can you pick one? To start off, the number is EUR 499/EUR 599, respectively for the 16GB/2GB RAM and 32GB/3GB RAM models, and a number of European and Asian markets will get the chance to get their hands on one. Of course, considering its high price tag, picking the Mate7 shouldn't be considered a trivial decision, but it has definitely won our support. This honestly is a great piece of tech, so the only question that remains is whether that's enough to make up for the company's relative unpopularity in the West.